EAST LANSING, Mich. -- For those who had questioned Michigan State’s Big Ten title credentials, Saturday reminded critics to pump the breaks just a little bit. The Spartans got out of the blocks quickly on their way to a 79-55 victory over Minnesota, ending a three-game losing streak and keeping themselves within a game of Michigan in the Big Ten conference standings. After Nick Ward and Matt McQuaid were challenged in the middle of the week following some subpar performances, it was the two veterans who led MSU past the Gophers on Saturday afternoon. Ward played perhaps his best conference game this year, scoring 22 points on 9-of-14 shooting to go with 9 rebounds. McQuaid chipped in a season-high 18 points on 6-of-9 shooting, knocking down 4 of his 6 3-point attempts. He also added a career-high eight assists. 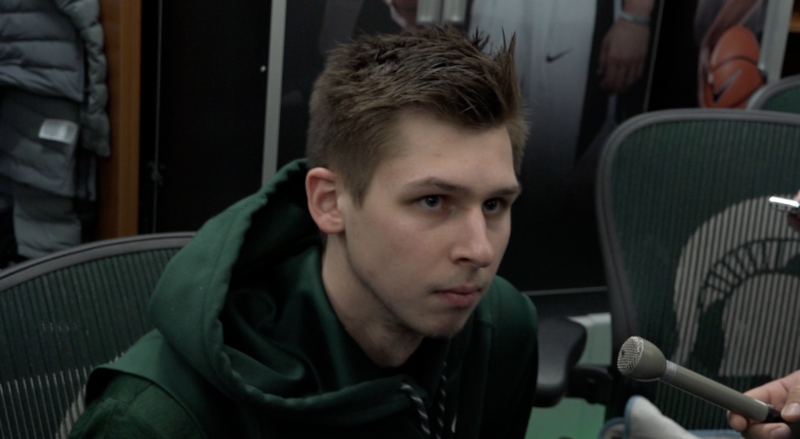 Matt McQuaid speaks to the media in the Michigan State locker room after the win over Minnesota. MSU wasted no time in righting the wrongs of their last two weeks, rolling out to a 21-5 lead to start the game. The problems that had plagued the Spartans in consecutive losses to Purdue, Indiana and Illinois were ironed out in midweek. MSU gave up just 10 offensive rebounds to Minnesota while committing 9 turnovers, compared to the 24 they committed at Illinois on Tuesday. Two early fouls to Cassius Winston kept him out for a large chunk of the first half. As a result, Foster Loyer got his first extended run of minutes in Big Ten play before picking up two fouls of his own. With Kenny Goins picking up an early injury, MSU’s bench had to play long stretches in the first half. Solid defense kept MSU in a healthy spot heading into halftime, where they led 35-24. Goins stayed out for the remainder of the game after landing awkwardly on his left arm midway through the first half. Izzo mentioned postgame that he was unsure as to the severity of Goins’ injury. With Winston back in for the second half, MSU started another half strong, as Winston found Ward on the fast break for a left-handed jam before hitting a layup the next time down. A Winston layup forced a Richard Pitino timeout just two minutes into the half. The second half belonged to McQuaid. His pair of 3-pointers keyed a 13-4 MSU run that left little doubt as to the outcome. Despite Minnesota’s Daniel Oturu finding some space inside offensively, McQuaid’s shooting and Winston’s ability on the dribble-drive kept the Spartans’ offense humming. A welcome change for the Spartans on Saturday was their defensive intensity. McQuaid’s big game included effective defense on the perimeter against leading scorer Amir Coffey. The junior guard came into Saturday scoring 16 points a game but was held to just 4 points on 2-of-6 shooting. With the Goins injury limiting frontcourt depth, freshman Marcus Bingham Jr. saw extended minutes for the first time since the start of the calendar year, though he didn’t make a shot in 7 minutes. MSU didn’t need Winston to do too much offensively - instead, he focused on setting up his teammates. He finished with just 11 points - his lowest total in a month - but added 9 assists to go with 0 turnovers. Minnesota’s Gabe Kalscheur was their top scorer, hitting a trio of 3-pointers on his way to 17 points. Oturu was next-best with 12 in 23 minutes as he battled foul trouble. MSU next faces a trip to Wisconsin on Tuesday with tipoff scheduled for 7 p.m. Minnesota will travel to Nebraska on Wednesday with that game scheduled for 9 p.m.